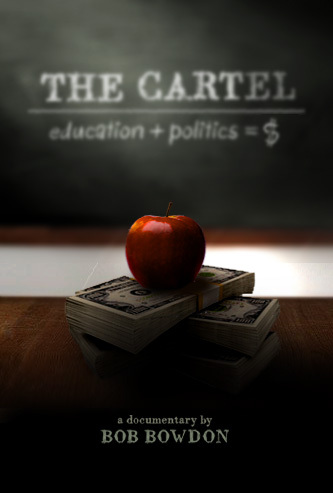 “The Cartel” is a eye-opening new documentary, focusing on spending for schools and education. This is a subject that is seldom investigated, and quite frankly something that there is a lot of ignorance about. The film shows us how throwing money at a problem is rarely a solution, and how a little healthy competition can go a long way. The documentary is very insightful, especially due to the fact that it covers a subject that is not rarely debated. In an interview with Bob, he told me that the media rarely questions the public education system when they speak with their representatives. Union leaders are rarely challenged, even when they are “defending the indefendible” as Bob puts it. There are many stories that are never heard, about teachers and administrators being punished or even fired for doing the right thing. And sometimes their careers are threatened in an attempt to silence them. These are the kind of actions that earns them the nickname “The Cartel.” The question is, why would these officials and public educators do such terrible things? Unfortunately, as you might have guessed, it comes down to the money. And because there are so many jobs at stake, many of them tenured and over-payed. And all the while they are trying to remove any competition, and the choice to send children to better schools. The film touches on topics that the general public is just not familiar with, so it makes for a very interesting documentary. One of the most shocking subjects of the film is the overall inefficiency in many schools. Bob chose to investigate the New Jersey school system not only because he has lived there for many years, but also because they have the highest spending per class out of any other state. He found that even though teachers are paid an average of fifty to fifty-five thousand dollars per year, some classrooms are getting upwards of three to four-hundred thousand dollars of funding each year. That’s a lot of money going somewhere beside to the teachers, and many of the people he interviewed felt that there was nothing to show for it. Bob did several man-on-street type interviews where he asked if giving poorly performing schools more money would help. Everyone he asked said yes. But when he told them how much money these schools were already getting per class, the same people were astonished. Most of the audiences will likely have the same reaction. In comparison, we are also shown charter schools in the area that achieve proficiencies in language arts and math that are between 38.5% and 57.5 higher. And they do so for only $0.64 cents on the dollar compared to the some district schools. It shows how the system can be ran much more efficiently, and provide better results and environments for their students. “The Cartel” is an extremely interesting documentary, touching upon things that affect every single person in the US. As a country, we spend more on education than anyone else in the world. Yet when tested, our students are often times less proficient in subjects than significantly undeveloped countries. Spending more and more money, when billions are already being directed to the system, has proven to be a failing strategy. This is a film that everyone can learn from, and it is important for people to understand what is really going on in education. “The Cartel” is an A.